NewsRob: Does NewsRob keep force closing on you when signing in??? Does NewsRob keep force closing on you when signing in??? 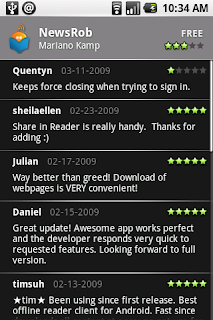 Well usually I am happy when somebody takes the time to comment on or rate NewsRob in the Android Market, but now I got this wonderful comment/rating (see on the right) and meanwhile believe that it might be fake. As I don't have any way of contacting the commenter and he didn't contact me, I'd like to know, just in case, if anybody else experiences NewsRob force closing (when signing in)? If you do, please let me know. If you have any other issue, please contact me at newsrob.support@gmail.com. I might need your help to reproduce the error, but will look into that issue then. This weekend's release will be faster again, restore the star, will double the size of the touchable areas of buttons (star, globe), support Google Apps For Your Domain accounts and introduce a simpler navigation between articles. As Quentyn isn't fake and subscribed to this blog, a line of communication opened and he is quite the nice gentleman. We were able to solve the situation quickly and will all live happily ever after.